2. Categorization of questions in different areas. 3. Every question has different options which allows user to think and guess his/her choice. Later on user can also verify his/her answer. 4. Every question has its answer defined. 6. A tips section which lets the user to know about do's and dont's before and after the interview. 7. 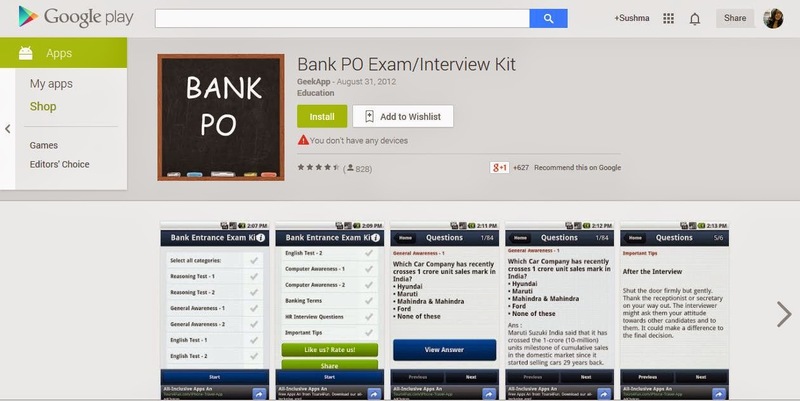 It's FREE.Identifying the need for a mobile based education solution for Indian students and with the growing android market, GeekApp has launched an android app that enables students to prepare for Bank exams at their finger tips over their mobile phones.